2018 has been another eventful year in the world of search engine optimization. We saw several algorithm updates, changes in the SERPs, advancements in AI, the implementation of GDPR, an increased focus on Expertise, Authority, and Trustworthiness (E-A-T) for web content, and plenty of other big SEO developments. It’s time to evaluate our progress in the past 12 months, identify the key trends that will affect the search landscape next year, and recalibrate our SEO plan for maximum results. Want to know what SEO strategies and tactics will work and help you dominate in the SERPs and earn more revenue in 2019? 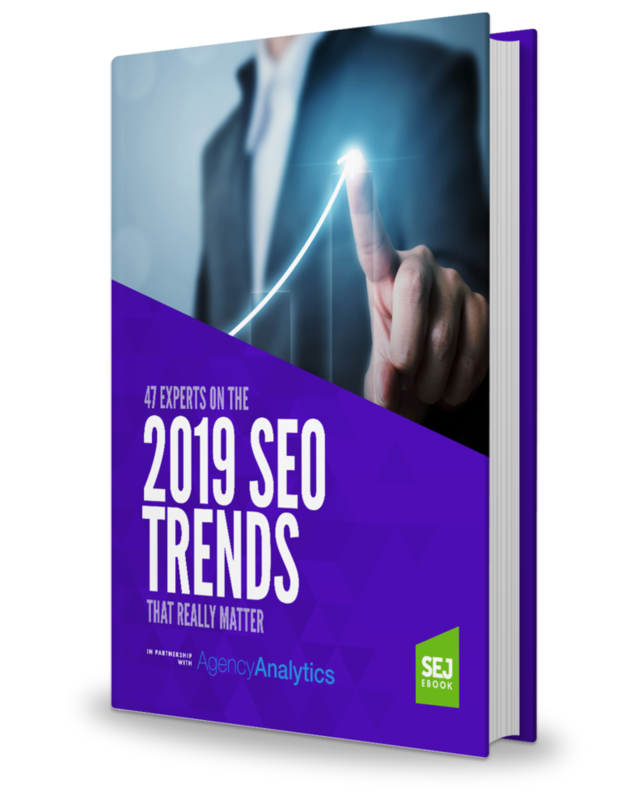 Download our ebook and discover the most important trends you need to know in 2019, according to 47 of today’s top SEO professionals. Jamie Alberico, Dawn Anderson, Jim Bader, Andy Betts, Michael Bonfils, Doc Sheldon Campbell, Catfish Comstock, Dave Davies, Frédéric Dubut, Eric Enge, Shelly Fagin, Casie Gillette, Keith Goode, Brian Harnish, Jim Hedger, Jon Henshaw, Sam Hollingsworth, Motoko Hunt, Mark Jackson, Dixon Jones, Ryan Jones, Jeremy Knauff, Cindy Krum, Ian Lurie, Jenn Mathews, Julia McCoy, Jesse McDonald, Corey Morris, Chuck Price, Arsen Rabinovich, Adam Riemer, Alexis Sanders, Kristine Schachinger, Jes Scholz, Eli Schwartz, Paul Shapiro, JP Sherman, Matt Siltala, Grant Simmons, Bill Slawski, Aleyda Solis, Alexandra Tachalova, Marcus Tandler, Shelley Walsh, Frank Watson, Mindy Weinstein, and Tony Wright.